IN THIS ARTICLE, WE HAVE SHARED THE TOP 6 BEST AD BLOCKER APPS FOR ANDROID THAT YOU CAN TRY IF YOU DON’T WANT TO SEE THOSE ANNOYING ADS. There is no doubt that all those advertisements and popups that we see while surfing web pages on the internet annoy us. Now, you will see ads on our site also, but there is a difference between ‘Annoying Ads‘ and ‘non-intrusive ads‘. Some sites provide quality content and only 3-4 ads on the whole page which don’t make our reading experience bad. Then, there are those blogs that have ads everywhere, and it becomes really difficult to read posts due to the ads and also the annoying popups. READ: uBlock Origin vs Adblock Plus – Which One is Better? We see a lot of Advertisements while Surfing Internet as well, especially when we need to download something and there are like six buttons of Download, out of which 5 are advertisements, and when we click on the button it redirects us to more ads which spoil our whole Mood. Well, not anymore. We know that ads can be blocked on the PC or Laptop’s browser by using the Adblockers. But, what about Android? Right now, maximum people surf the internet on a smartphone rather on the PC or Laptop. So, how to block ads on Android? Is there any Ad Blocker for Android Also? The answer is YES! There are a lot of Ad Blockers for Android, and in this article, we are sharing the list of Best Ad Blocker Apps for Android. Let’s begin. The first App on our list is the AdBlock Plus. Unfortunately, you cannot find this app in the Play Store as it has been removed from there due to some policies of Google. But, fortunately enough you can still get this App on the Official Website of AdBlock Plus for your Android Device. Also, on the site itself, you will find the full guide to install and use this app which is great as you don’t need to search on the web if you don’t know how this app works. 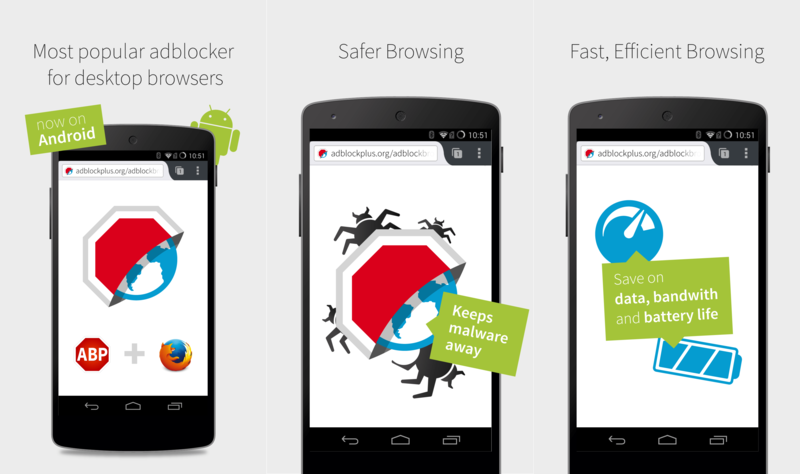 Adblock Plus is the most trusted and most popular ad blocker for Chrome and Firefox on PC, and it is now available for Android also. So, tired of those annoying pop-ups and ads? Well, AdBlock Plus is here to the rescue. The Developers have also made an AdBlock browser that has the AdBlock Plus’ functionality pre-installed, so you don’t need to install any third party application on your phone to block the ads and pop-ups. The Adblock Browser is an easy to use, a customizable web browser that gives you control over your mobile browsing experience. Block ads, browse faster, save battery life & data. Quick, safe & private. The Free Adblock Browser is available for free on the Google Play Store; the browser has many features including themes which let you customize the Browser the way you like it. Adguard can block ALL kinds of ads, not only in browsers but also in games and apps! With the help of Firewall, Adguard can manage apps access to the Internet, as well as their filtering. This app is easy-to-use, the interface is intuitive: one button to start protection. Protection from malware and phishing. Adguard won’t let you become a victim of fraud. 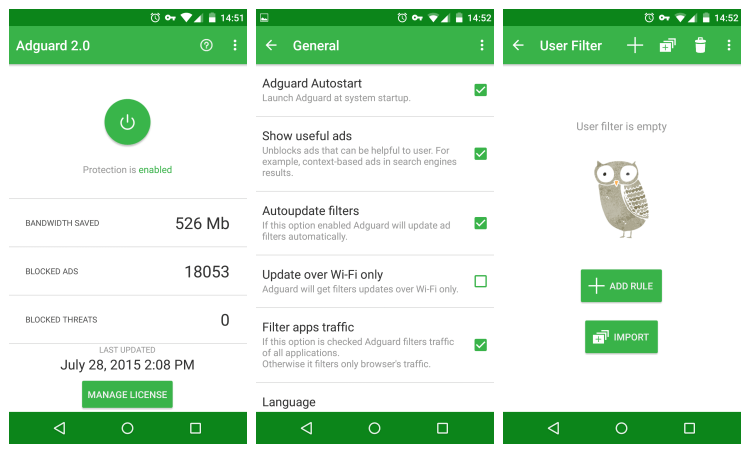 Adguard provides the best filtering quality on Android; there has been no app with such a high. The app speeds up a load of web pages. The pages are ad-free and opened faster. Protection of your data. Adguard won’t let anyone track you on the web. Adguard makes the Internet more clean, comfortable and safe for the user. See for yourself! Unfortunately, this app is also not available on the Google Play Store, but you can get this AdGuard for your Android Device for free from the official site. You can install this App as a normal APK File, and the functioning of the App is also simple, just open the App, and you’ll get every option in front of you. 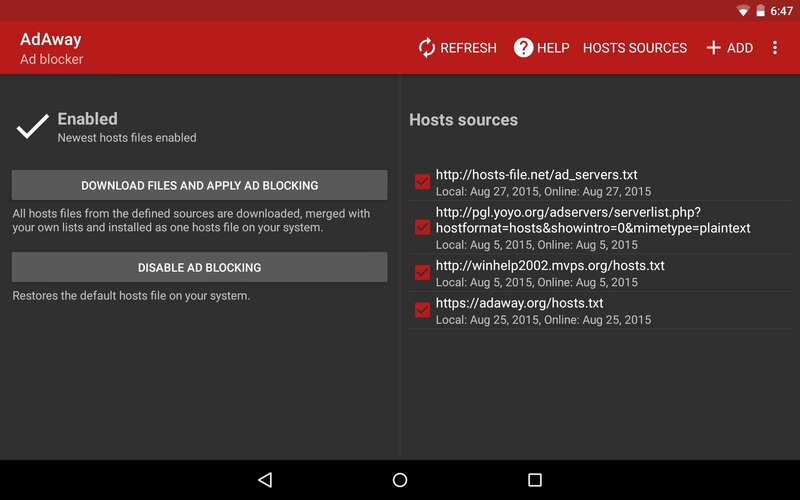 AdAway is one of the Most popular Ad Blocker App in the History of AdBlocker Apps for Android. This App is still a solid option if you have Root Access on your Smartphone. In case you don’t have Root Access on your Android or just don’t know What this “Root Access” really is, then you just simply ignore this App and have a look at other Apps. This is one of the few ad blockers for Android that uses hosts File. So basically, a host file on Android contains a list of mappings between the IP addresses and the host names. This App kills all the Popups and advertisements on your smartphone, no matter if you are playing a game or browsing the Internet, this app will prevent all the Advertisements. In case you want a bit more control over your content, then there is also a Whitelist feature within the App that you can Use. Please Note that you can only use this App if you have Root Access. Download it here. Helps you to get rid of annoying ad notifications and bookmarks on your desktop. Become aware of what apps have permissions to access your messages or accounts and could thus invade your privacy, or can use services which could cost you money, and helps you with their removal. AppBrain Ad Detector is available for free on the Google Play Store. Check this Amazing Ad Blocker App out. TrustGo Ad Detector is a different Ad Blocker App for Android that sits on Number 6 in our List of Best Android Ad Blockers. This App will scan all your Apps and collect Ad Information from all those Apps and protect you from the Advertisement networks collecting personal information through the apps that you are using. 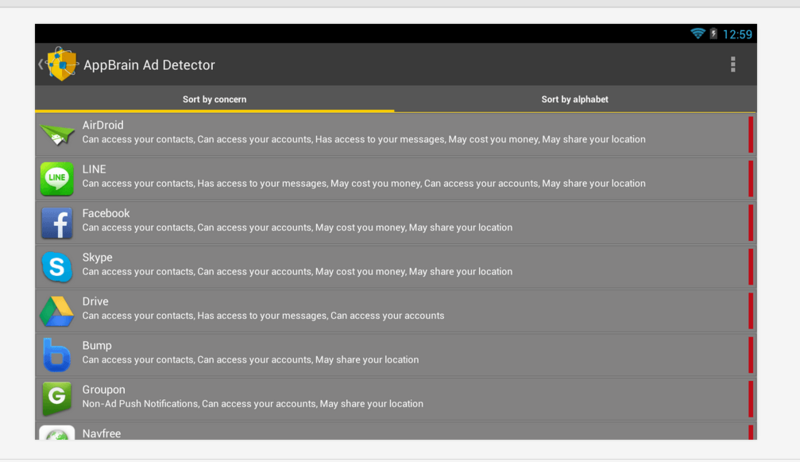 The TrustGO Ad Detector Dually helps your Android Device by blocking ads and Keeping your Personal Data Safe. The TrustGo Ad Detector App is available for free to Download from the Google Play Store; you should take a look at the App if you are concerned with your Privacy and Information. So, that was our List of Some of the Best Ad Blocker Apps for Android that you can try right now on your Android smartphone. We hope that this Article helped you to get relief from all those annoying ads. If you think that we missed any app that deserves to be in the List or if you have any questions or feedback, you can leave them in the comments section down below. We would love to hear what you guys think about this.